The Shaker stool chair is handmade to order from our unique Ambrozia black textured steel tubing frame and a premium vinyl upholstered seat and back. Inspired by the boarding ladder steps of an old boat. The anti-slip wooden footrest offer a subtile warm touch to your feet. 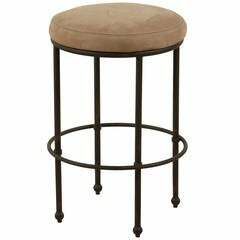 This contemporary stool chair is a popular piece for an home kitchen or a restaurant / bar. Designed to last and age gracefully through generations of use. Available in (bar height 31'' (SH) counter height 25'' (SH) or custom height) and custom finishes. Handmade to order in our workshop/studio in Canada. Each piece are signed with our signature brass medallion. Ambrozia Furniture is committed to design & manufacture the highest-quality furniture and accessories that is entirely made in Canada. Inspired by noble materials that grow more beautiful with time and timeless design. We believe that furnitures are part of our identity and truly beautify our everyday’s environment. They must reflect the authenticity and the purity of people that lives in. We believe that small details make the difference in every products and this guides us in the whole process of designing and making our products. In our studio, we work with natural and noble materials in various forms. We strive to bring out the real beauty found in each of these nature pieces. We’re constantly experimenting with new materials and processes to enlarge our variety of products & finishes for our customers. 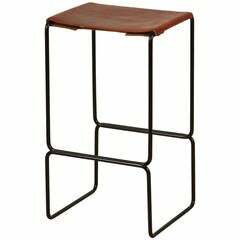 Leather counterstool by Ten10. Available to order in black or cognac leather or in black or white marine grade nylon cording with a 10-12 week lead time. The Elysian counterstool is a modern take on the classic stool. Available to order in Customer's Own Material with a 6-8 week lead time. As shown: $1,330 To order: $1,150 + COM.